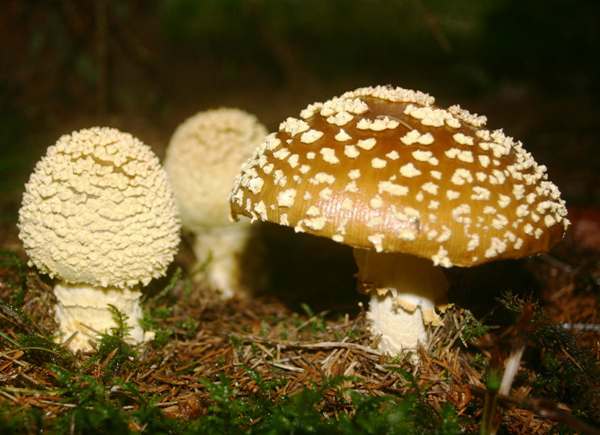 The Brown Fly Agaric, Amanita regalis, is not reported from Britain or Ireland, but it is quite common in Scandinavia. Apart from cap colour it is similar in size and form to the red Fly Agaric. Like the Fly Agaric, this large member of the genus Amanita is also hallucinogenic and can cause sickness and other distressing effects if it is eaten. The Brown Fly Agaric is fairly common in Scandinavia; I came across the specimens shown on this page while I was visiting southern Sweden in 2005. Amanita regalis occurs also in some eastern European countries as well as in North America, where it is currently recorded only from Alaska. 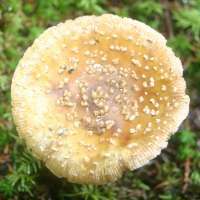 This species has been formally recorded only twice in Britain and is rarely if ever seen in warm southern countries in Europe, where the superficially similar but smaller Panthercap, Amanita pantherina does occur. In his Systema Mycologicum, published in 1821, Elias Magnus Fries described this mushroom under the name Agaricus muscarius β regalis. In 1887 Pier Andrea Saccardo transferred it to the genus Amanita, but only as a variety of the Fly Agaric Amanita muscaria. It was Edmund Michael (1849 - 1920) who, in 1903, first treated this mushroom as a distinct species, giving it its current name Amanita regalis. Among the many synonyms of Amanita regalis are Amanita umbrina Pers., Agaricus muscarius var. umbrinus (Pers.) 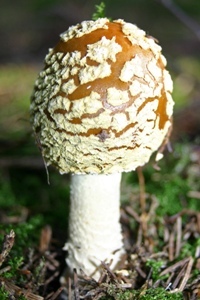 Fr., Amanita muscaria var. regalis (Fr.) Sacc., Amanita emilii Riel and Amanitaria muscaria var. regalis (Fr.) E.-J.Gilbert. The common name Brown Fly Agaric suggests that this might be a very close relative of the Fly Agaric, Amanita muscaria. Indeed it is, and for many years it was treated as a variety of its more famous relative the (red) Fly Agaric; however, nowadays most authorities award it species status. The specific epithet regalis means royal, and among the many common names given to this beautiful mushroom are Royal Fly Agaric, King Fly Agaric, and King of Sweden Amanita. Amanita regalis is one of my favourite mushrooms - to see, but not to eat. The white or more often yellowish fragments of partial veil which adhere to the cap make this large woodland rarity one of the most beautiful of all fungi, and so it is a great shame that so few people ever get to see them. I have therefore included a few extra pictures in the Identification section below. 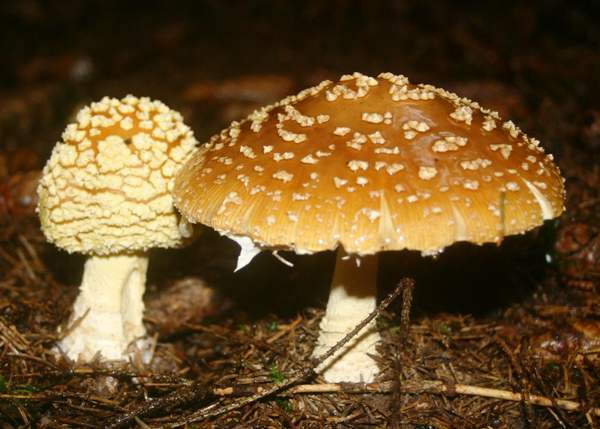 Because of its large size and vestigial volva, the Brown Fly Agaric is unlikely to be confused with the Panthercap, Amanita pantherina, but some Blushers (Amanita rubescens) can look quite similar; however, the flesh of a Blusher turns pink when it is damaged whereas cutting a Brown Fly Agaric causes no significant colour change in its flesh. 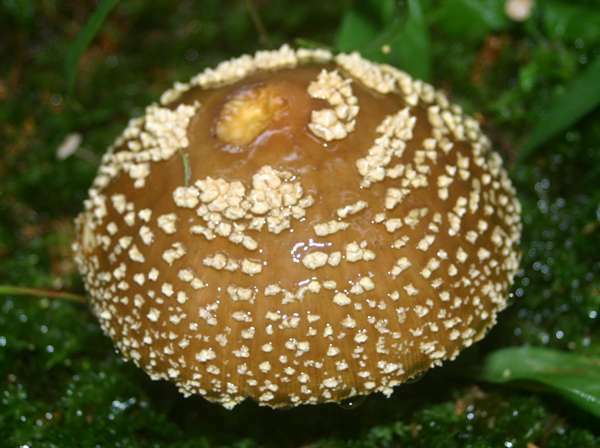 Initially egg shaped, becoming convex and eventually flattening out to between 10 and 20cm in diameter, the caps of Amanita regalis are glossy brown; usually retaining irregular, white fragments of the universal veil. At maturity the caps flatten out and occasionally become shallowly concave. Like the closely related Amanita muscaria (Fly Agaric) the Brown Fly Agaric usually retains its warty veil fragments, but in very wet weather the veil fragments can get washed off; this makes misidentification more likely. 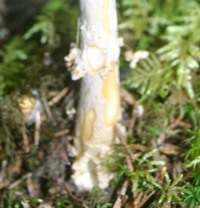 The volva at the base of the stem is then an important identifying feature. White, free, crowded. The gills turn pale yellow as the fruitbody matures. 10 - 25cm long and 1.5 - 2cm in diameter, the stems of Amanita regalis are white and ragged with a grooved, hanging ring. The swollen base retains the white, sack-like remains of the volva, which eventually fragments into rings of scales around the base of mature specimens. Broadly ellipsoidal, 8-10 x 6-7μm; inamyloid. Mycorhizal with conifers, notably spruce as in the case of the mature specimens pictured on the left, and with birches..
August to October in Britain; July to September in Scandinavia. Amanita caesarea (Caesar's Mushroom) is rarely if ever found in northern Europe; its cap is brilliant orange without small veil fragments but with a striated margin, and the stipe is yellow. The caps of some examples of Amanita rubescens are glossy brown, but their stems and their cap flesh always turn red when damaged. Fascinated by Fungi, Pat O'Reilly, 2011.